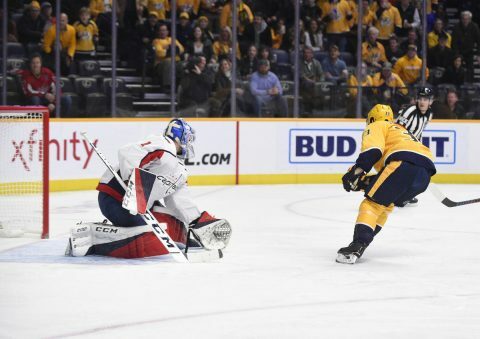 Nashville, Tn — The Nashville Predators defeated the Stanley Cup Champion Washington Capitals tonight at Bridgestone Arena, 7-2, behind Viktor Arvidssons hat-trick. The Arvidsson hat-trick, plus a two goal night for Nick Bonino led the charge for the Predators. Juuse Saros got the start in goal and was impressive as ever, stopping 26 of 28 shots on goal. The Predators had 29 shots on goal and scored 7. The most impressive goal of the night though came from Rocco Grimaldi, who stole the puck at the blue line and drove to the net, doing the “spin-o-rama” backhand that went into the net. The goal brought the Nashville crowd to a fever pitch and even had goalie Pekka Rinne standing on the Predator’s bench waving the white towel above his head. After a fairly successful road trip, their longest of the season, the Predators had a sour taste in their mouth after the loss to the Carolina Hurricanes on Sunday. A team they were expected to beat. T.J Oshie and Nicklas Backstrom scored the two goals for the Capitals and Alex Ovechkin was a non factor in tonight’s game. Tonight was the first of a three game homestand for Nashville, with the Winnipeg Jets in town on Thursday night. The Florida Panthers will be in town on Saturday night. Puck drops for both games at 7pm. The Predators and the Jets are running neck and neck in the Central Division of the Western Conference. 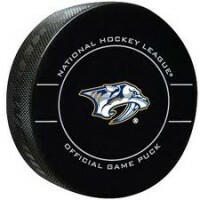 Nashville won their first meeting at the Bridgestone Arena earlier this year.